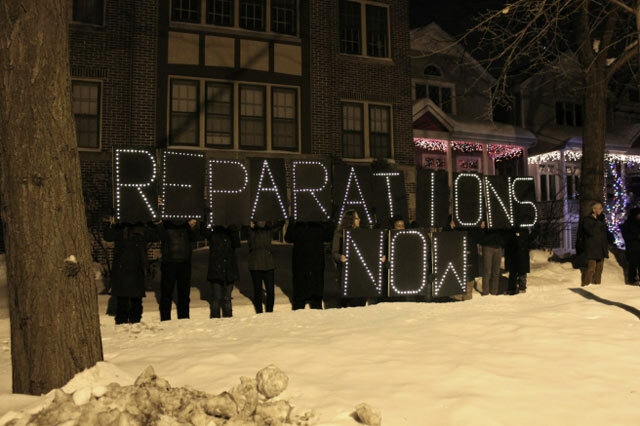 Last night, members of The Chicago Light Brigade, Project NIA, and Chicago Torture Justice Memorials gathered with friends and allies outside Mayor Rahm Emanuel’s house to demand reparations for acts of torture committed by former police Commander Jon Burge and his “midnight crew.” An ordinance that would provide $20 million in compensation to Burge’s victims has the support of the majority of the city council, but as a matter of political convenience, the measure has been left to languish in the Finance Committee. It is no secret to anyone involved in this fight, from victims to activists to politicians, that with the mayor’s support, this ordinance would move forward. It’s the idea of moving on that I want to address here. People of color who want some measure of justice for harms done are frequently told to “move on.” Whether the wrongs being discussed are centuries old, decades old, or mere months old, the response remains the same: It happened. Move on. Whether you are talking about slavery, Ferguson, or justice for CPD torture survivors, white people in positions of power have their own priorities to attend to, and they would really rather you just moved on. For individuals who cannot pursue financial redress in the courts, because the statute of limitations has run out, or because they were bullied into accepting a minor settlement while still in prison, some monetary compensation would be a good first step toward moving on. $20 million dollars may sound like a lot of money, but considering the scope of the harms done, and the number of people affected, this number is beyond reasonable. It is also the amount that the city deigned to spend defending Jon Burge’s reign of terror in the courts. It only seems reasonable that the city should invest as much in this ordinance as it did in defending a man who committed acts of torture on its behalf. The proposed ordinance would also provide all torture survivors and their families with tuition-free education at City Colleges; create a center on the South Side of Chicago that would provide psychological counseling, health care services and vocational training to those affected by law enforcement torture and abuse; and require Chicago Public Schools to teach about these cases and sponsor the construction of public torture memorials. It would also require the city’s leaders to issue a formal apology to those who were tortured and their communities. If you want a formula for truth, reconciliation, and moving on, Mr. Mayor, I believe you’ve been handed one. Next week, we will be presented with another example of what moving on looks like. Jon Burge, who perpetrated and oversaw the torture of those now seeking justice, will begin his parole. For Jon Burge, moving on means freedom and a city pension. While many of his victims remain incarcerated, and while survivors of his torture continue to cry out for compensation and a broader acknowledgment of what was done to them, Burge will move on, at the tax payer’s expense. Burge’s parole begins on February 14, 2015. For Rahm Emanuel to allow that day to pass without having first delivered justice to Burge’s victims is unthinkable, and he must be made to understand as much. For that reason, we gathered last night outside Rahm’s home. After the many meetings, petitions, and protests that have been organized behind this demand, we decided it was time to bring our message to Emanuel’s house, to remind him that he cannot ignore what’s been left at his doorstep. It is in his power to call on Alderman Ed Burke to give the ordinance a hearing, and to ask the city council to give the measure their full support. He has the power see to it that victims are able to do what he insists the whole city must. He has the power to allow Burge’s victims to move on. And until he does, this campaign for truth and justice will continue to escalate.